In much the same way as painting, panoramic views faithfully reflect nature, but, in extending further than painting, they convert it into a lifelike experience thanks to the lighting, generating transitions of light that imitate day and night using effects normally associated with illusionism. In employing features that belong to the scenic arts, panoramic views represent at the same time the prelude to “”photography, silent film and sound film”2. These modes of recording a world in constant flux (modes engaged in an almost constant transition and interrelated with each other), became gradually more feasible when technological advances made it possible to convert into scientific practice the theory that enabled the albeit problematic use of the magic lantern. As a result of one of these transitions, Daguerre, after losing his most developed panoramic views in a fire in 1839, unveiled his daguerreotype, an improved appropriation of the methods of Nicéphore Niépce (above all in relation to the medium and the fixing of the image), something that gave him a disproportionate amount of fame as a pioneer and a consummate illusionist. In other words, if the panoramic views can be viewed as the extension of painting within the ambit of the scenic arts, the appearance of photography momentarily and fragmentarily fixes part of that mystery played out in the settings. If lighting bestows credibility and verisimilitude upon large panoramic settings, then light is the essential material that enables the photographic act to take place, allowing both the photograph to be taken and the resulting image to emerge on a sensitised glass plate. By following the relevant thread, we can interpret the shop windows of the arcades as screens onto which products are projected, visible behind the transparency of the glass and inaccessible due to the pure thickness of its surface. They drive a desire that is only satisfied by the action of buying and selling. In the objects displayed in them we not only see the goods that we wish to purchase, we also project ourselves into a mental space where we ‘are wearing the clothes, eating the food, using the utensils or living with the furniture put in front of us. This projection operates, at the very least, in two directions. In seeing ourselves within this imaginary world, we plan the future from the present, we create a line of action, we want to see that this journey we are embarking on is feasible. On the other hand, we project an illusory reflection of ourselves, an idyllic image in which the future we imagine does not exist, and in which we would be incapable of handling it with complete freedom should we find ourselves in it. The truth is, we cannot control something that is shown to be intangible and which is also, to all intents and purposes, impossible to predict. It is for this reason that the now ubiquitous compendium of artistic/social connotations that is cinema, whose high-quality prologue is written by the intense history of photography and other advances sensitive to the recording of the world, can be seen as the starting point of models revolving around the concept of desire: its impossible definitive conception (in that it is nothing other than a virtual projection on a screen); and its insatiable appeal (even in the knowledge of its non-conceivable character, we still want to see more and more derivatives of it). This figurative desire has traced a fascinating path that runs from modes of collective contemplation to others where the need for individual viewings and non-transferable personal experiences has been marked out with increasing clarity. Nevertheless, an initial phase in this differentiation was already present in the origins of the cinematic experience. Whereas the Lumière brothers, with their cinematograph (1895), enabled people to come together to watch cinema, linking it forever to the world of spectacle, Thomas Edison’s (1891-1894) kinetoscope laid the basis for the individualised enjoyment of the moving image, in the unreserved belief that there was no future in the social and collective act of viewing -either in cafes, in the early days, or in specially created rooms later on-. Was Edison, as the entire century that followed sought to demonstrate, really so wrong? It would perhaps be inaccurate to analyse both these options, synthesised herein, in line with such clearly delineated concepts as right or wrong, success or failure, as much as history enjoys such polarised divisions. With the supersonic intervention of digital technology, we now find ourselves at the onset of another technological revolution comparable to the one instigated by the appearance of photography and cinema, which were mainly differentiated (or nuanced rather) by the immediacy of the results, the speed of the perpetual changes, the technical (yet ideological) impossibility of an about-turn or even a simulated slowing-down of events. As a consequence, this constant, regular, unstoppable speed can only be analysed from the perspective of the individual, through an interchangeable interface that is employed solely by a single person: unipersonality, individualism, solitude in the face of the retro-lit screen. Collective networks created by the Internet generate a not-insignificant paradox: designed to provide wide-ranging solutions, they can only be responded to by individuals who know their logins, passwords, and access routes. Virtuality, perhaps as a reaffirmation of itself or because of the fear of being swallowed up by its own inconsistency, is obliged to surround itself with specific elements, passwords, serial numbers and compatible updates desperately anxious to replace what was there previously. All in all a vast range of options concealed behind the apparently cold and static normality of a screen (a window, but also a mirror) that is representative of each individual. However, underlying the concepts of absolute freedom are obstacles, restrictions, surveillance and control of practically every movement designed to expand the field of activity. Any action of this type generates, as a co-active counterbalance, a reaction that attempts to cancel or subdue it. Behind the translucent plastic casing and crystalline plasma screens of its machines, this transparent society retains part of the darkness so characteristic of the most time-honoured and claustrophobic subjugation of freedoms. Daniel G. Andújar and Technologies To The People (TTTP) have taken particular interest in the development and use of virtual communication and information networks, such as translation, at the level of the society in which they originate and which they represent. Their e-projects3 set out to respond to specific real needs of a certain sector of the population, through instruments based on virtuality, free access and an almost literal transcription of the Foucaultian “tool box”, where philosophy is replaced by a type of technology that is more social than scientific, more participative than contemplative. As they are virtual spaces of freedom, they become places that generate real dialectic conflicts between users- a micro-society that settles its differences as a mimesis of society in general. Elements such as accessibility, individuality, security, etc. lead to the possibility of constructing the surrounding world around it, with the added advantage of a wide range of options and the free selection of them. Obviously, this construction is based on existing cultural models tailored to the real demands of each user, including the organisation of their milieu in accordance with their needs, tastes or preferences. In this respect, Hack Landscape signifies one more stage in the development of personalised tools and perhaps constitutes one of the installations that best demonstrates, from a symbolic point of view, this social model supported around the construction of the milieu itself. 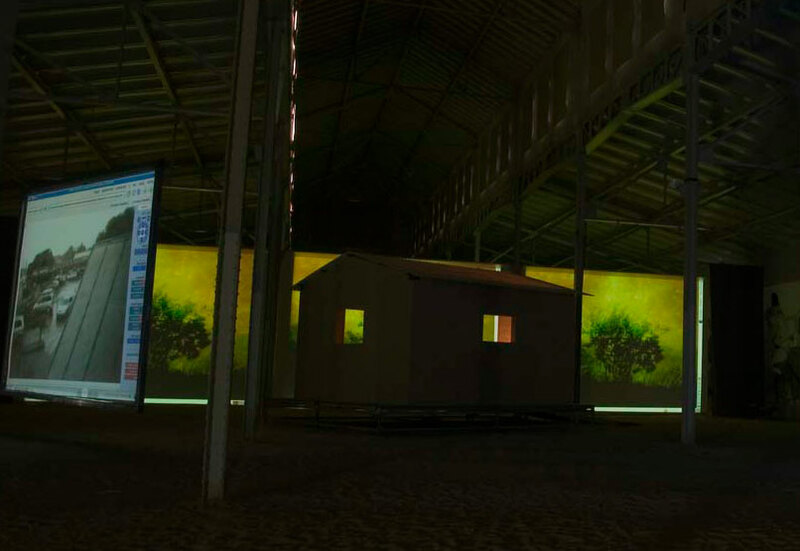 It is a house/study that features several retro-projections of varying sizes positioned in such a way that they can be seen, totally or partially, from all four sides, and on whose walls are disposed windows or openings. The viewing public can see the mechanism used from the very beginning of the process. The production design is perfectly visible, as are the retro-projected screens and the interior space of the house, which is fitted out not in order to make it credible but to show it is functional and usable. It is for that reason that it has been conceived as a place of work as well as leisure, where technology is an omnipresent element, an unavoidable code (and an acquired civil right) for understanding the current mechanisms of the globalised world. From the inside of the room the screens are marginalised and delimited by the windows, each one of which -as elements that exist more than ever as connecters between two extreme spaces- offers a complex and different visual situation. It is from that vision that the screens supplant urban or natural spaces originating from fiction or taken directly, in real time, from a surveillance cameras. The unifying theme is the landscape or, to be exact, the representation of the landscape and our subjective, cultural and constructed vision of the original natural medium. The conflict between antagonists is clear from the very beginning. In addition to the aforementioned opposing effect between the visible structure of the projection mechanism and the illusion maintained from the room interior, the alternation between fiction and the reality of the projected audiovisual material can be added, as well as the continuous play between inside/outside, interior/exterior, light/shadow, etc., and, on the other hand, the eternal dichotomy between truth and untruth. Or between what is offered to us as true and that which we discover to be false. These two formal concepts, possessing a cultural and subjective construction, are usually associated with virtues or defects: goodness tends to be linked to truth, whereas falsity and untruths are linked to evil or disobedience (another erroneous and interestingly named concept). In this context, technology is used, and is propagated ad infinitum in the process, as an ideal tool for breaking up discourses designed to cause predetermined confusion, to offer an external image that conceals the real actions of its internal ideology. As a result. Hack Landscape reveals, in a single horizontal and dehierarchised plane, both the construction of the reality of the interior and the physical machinery that makes its technical and conceptual development possible. The argumentational origin of these oppositions has the potential to return us to the myth of the Platonic cave, where the shadows of real objects cast on the cavern employ here the polyvalent technology of audiovisual projections. For its part, the projected material, which acts as a synthesis of the recording that has been made individually or anonymously throughout the network, recreates from a multitude of angles an entire catalogue of mythological updates, from the reflection of Narcissus on the screen; to a sedentary and virtual Odyssey-“the motionless voyage”, in the words of Eugeni Bonet’- that is not far removed from cinematographic video-artistic and documentary references; and onto Sisyphus’ inability to keep his mind on all the things that are happening (or the stone on top of the mountain). From a semantic point of view, Hack Landscape refers in this context to the colloquial voice that relates “hackers” to “computer pirates” (the title can thus be translated as “to pirate” or “to appropriate landscapes”). However, as a verb, “hack” also means “cut something up roughly, chop it into pieces”. This definition lends it a hardened, premeditatedly cruel character. a meaning that emanates from the dominant power that, as in other installations created with the support of TTTP, sets out in this work to perform a 180º turn and thereby put the result of the coercion face to face with the element generating it. “watching the watchful” as it were”. By way of rounding off this very brief analysis, I would like to turn my attention to the concept of creating the environment itself, to the way in which society has changed its behavioural and relationship-related habits in moving from collective uses to individualised modes. The possibility of multiple means of accessing information, leisure, Culture, and virtual experimentation, has lead to the Illumination of one world inside another. The image of landscapes in relation to the city is enough to understand the virtual world inside the physical one, where even sensations seem to become increasingly similar to the original ones they mimic or supplant. Hack Landscape is in no way a catastrophic vision of society today. Rather, it attempts to demonstrate, somewhat remotely, almost objectively, new tools for personalising the professional and domestic environment, all the time fusing the historical separation between our working lives and personal lives, or between the space where we work and where we rest. Everything appears to move into a type of dynamic simulation in which the outlines become blurred and the references become confused, in much the same way as received, stolen or legally used images “rethink” the values of reality or fiction, of authorship or anonymity. The creation of the space that surrounds this house/study takes another step forward in the process of representing the exterior space (regardless of the quality of this landscape) and questions it. Is our field of vision reduced to a panoramic view, to an oblong format? Or is this way of seeing a cultural construction, a synthesis, the literal translation of the picture, frame, window or the screen in the end? Without question, more so in this than in any other case, the end is the beginning, the question is the answer, the definition forms part of the heading. All that remains is to look carefully, put the pieces together again and form a stance of one’s own from which to question, yet again, our entire surroundings. Benjamin, Walter, Ellibro de los pasajes, Madrid. Akal, 2005. p. 38.
e-valencia.org (online since November 2001, despite two attempts to censor it); e-barcelona.org (since 2004); a-sevilla.erg (since April2006); e-areo.org (created for Area 2003 but not online at the moment); e-seul and e-wac.org (created as part of the exhibition and debate project On Difference #1 organised by the Kunstverein in Stuttgart, online since May 2005). 4 . Bonet, Eugeni: La invitación a1 viaje / imagen-movimienro-tiempo. In, Movimiento aparente. La invitación al viaje inmóvil en las tecnofogías ubicuas del tiempo, la imagen y fa pantalla (catalogue). Espai d’Art Contemporani de Castelló-EACC, Generalitat Valenciana, 2000.